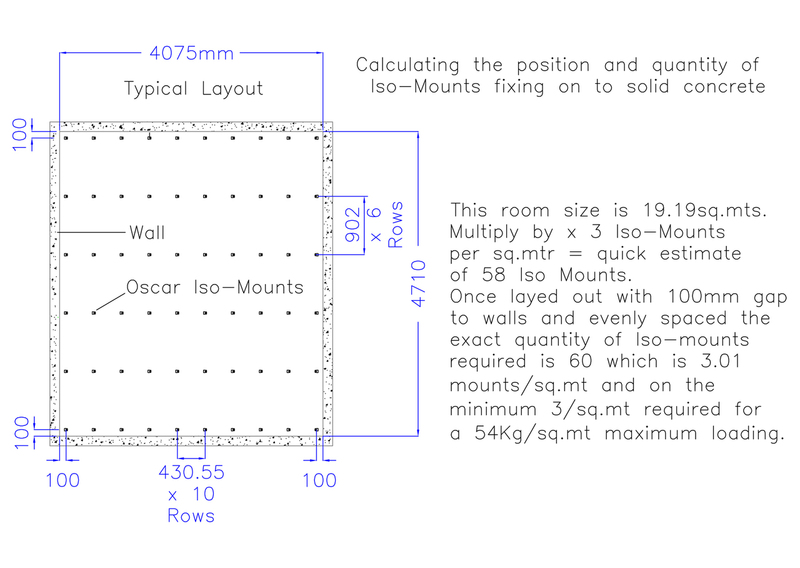 This is easier if done to scale on paper first but for a quick calculation take the square meterage of the room and multiply by 3 + 5% for the quantity of Iso-Mounts. 1. Decide which way you want the ‘C’ Channel to run. 3. Divide the space equally between the mounts positioned at 100mm in from the walls. The above example has 5 equal spaces of 902mm. Reducing to 4 equal spaces would result in less than 54Kg/sq.mtr maximum loading capability. When the iso-Mount positions are marked drill pilot holes for accuracy. Then drill a 6mm diameter hole 60mm deep and tightly fix an 8mm Concrete Socket Bolt, which forms its own thread in the concrete. 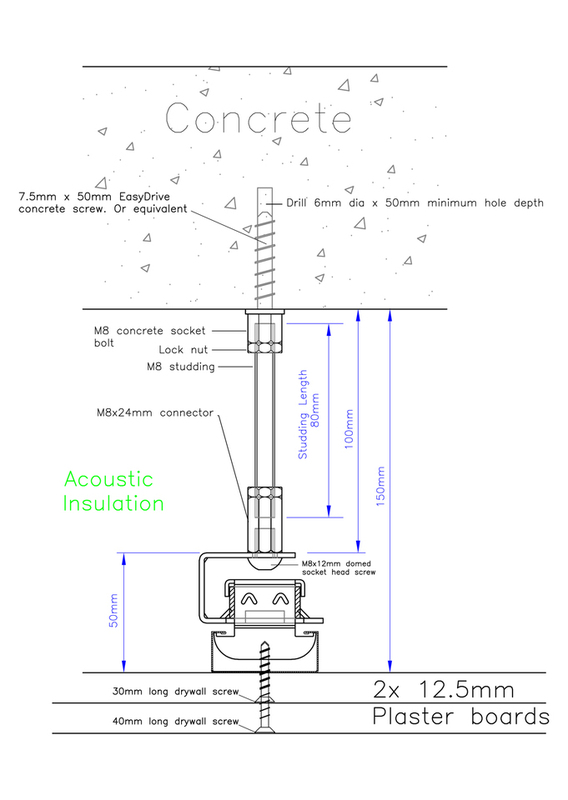 The length of M8 studding will be approximately 70mm less than the depth of the void. Insert the studding into the M8 Concrete Socket Bolt with a locking (half) nut underneath. Rotate a half locking nut onto the lower end of the studding followed by the M8 x24 connector. 4. Ensure the ‘C’ Brackets are firmly fixed and levels are satisfactory. 5. When all of the Iso-mount ‘C’ brackets are in position you are ready to assembly the other 2 components of the Iso-Mount: the rubber block and the saddle. Entry of these into the ‘C’ bracket is restricted so assemble the rubber block into position on the saddle first and then slide the assembly into position on the ‘C’ bracket. 6. Once assembled and seating correctly slide the Iso-Wedge into position, this will prevent the Iso-Mount coming apart when the ‘C’ channel is installed. Note: the Iso-Wedges are removed after the ‘C’ Channel is installed. 7. Before Clipping the ‘C’ Channel Into Position. 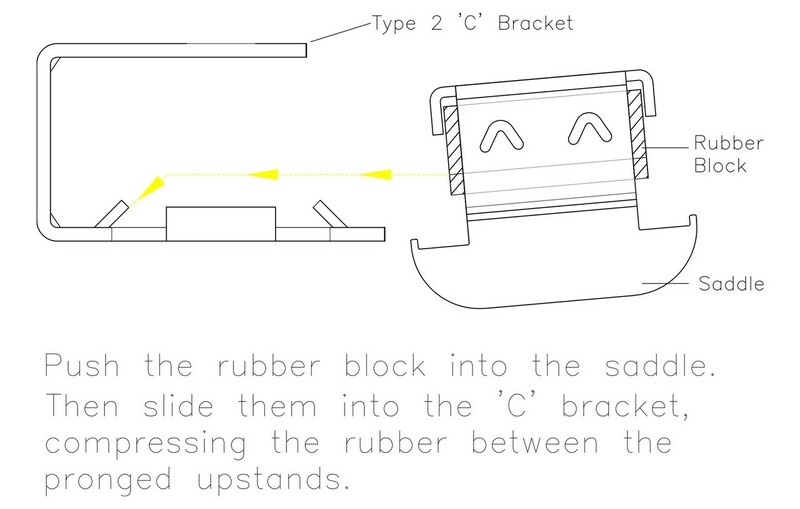 The ‘C’ channel clips into place in seconds but is difficult to remove if you find that you need to reposition some Iso-Mounts, you may have to cut a section of ‘C’ Channel away to allow the rest to slide off the hangers – if ‘C’ Channel becomes distorted don’t re-use it. 8. Check again that you are happy with the fixed positions of all the Iso-Mounts. Place Iso-Pegs between the top of the saddles and the ‘C’ brackets to hold the saddles in position whilst the ‘C’ channel is clipped on. Hook a length of C Channel onto 1 side of the saddle of 2 Iso-Mounts that are at least 1 metre apart, then squeeze the C Channel and saddle between your thumb and fingers and the channel will snap-fix into position. Repeat this along the rows of fixed Iso-Mounts. Mark a horizontal line around the wall at the calculated level of the underside of the floating ceiling, i.e. level with the underside of the plasterboard. When using 2 layers of 12.5mm plasterboard this will be 25mm, (1 inch), below the underside of the ‘C’ Channels. 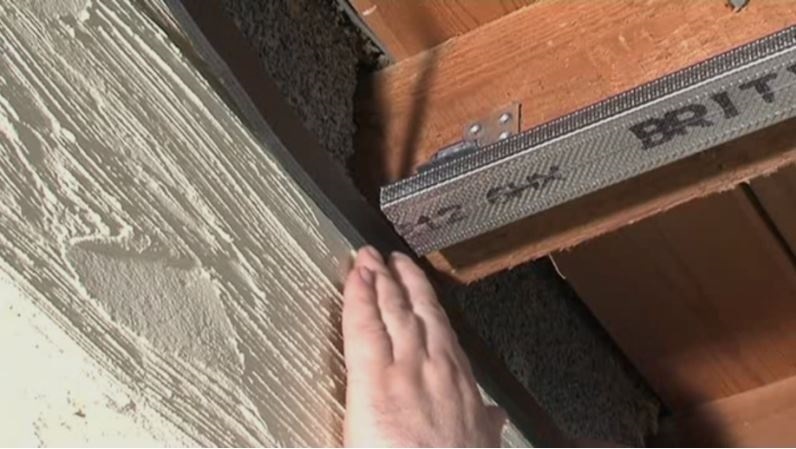 Install 25mm wide x 10mm thick (1x3/8”) self-adhesive Oscar Foam along this line with the bottom of the foam on top of and sitting 5 mm (3/16 inch) above the line – this allows for the foam to distort when compressed by the plasterboard and space for a bead of Oscar Seal flexible acoustic sealant. High density (60kg/cy.mtr (3.75lbs/cu.ft) or higher) mineral wool slab. 1. 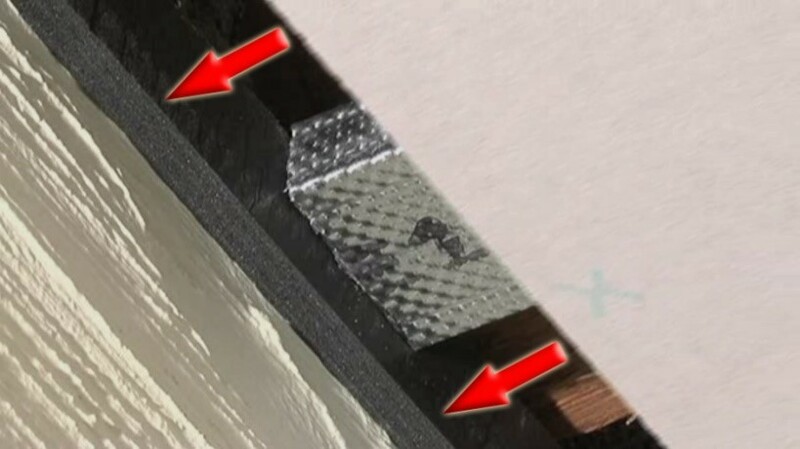 Fix the first layer of 12.5mm plasterboard with 25mm (1inch) drylining screws which will self-tap into the ‘C’ channel - Do not position screws under the joists or the Iso-Mounts where they may make contact and form a path for sound transmission. 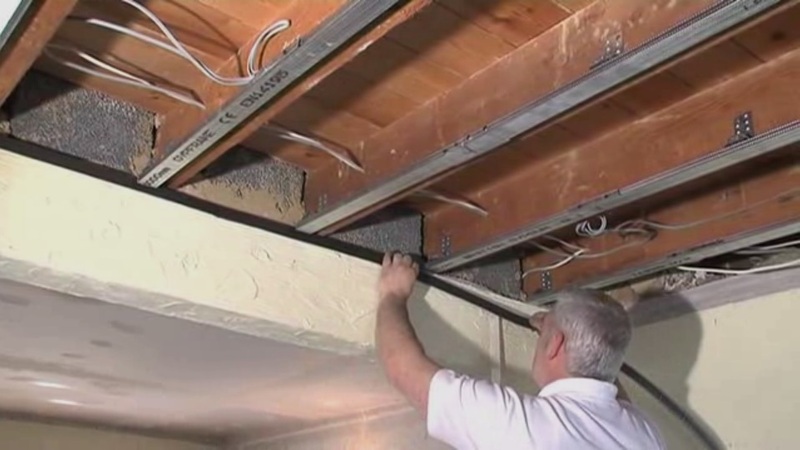 Keep the outer boards compressed into the Oscar Foam at the perimeter of the room. Keep gaps to the minimum and seal gaps with Oscar Seal. 2.For best results fix a second layer of plasterboard repeat the operation but stagger joints and use 38mm (1.1/2inch) drywall screws, Seal gaps with Oscar seal keeping level or below the surface of the board, then tape and joint the ceiling ready for plastering. 6. With the hose pushed as for as it can go into the void a marker is put onto the hose so the operator can measure that he has fully filled the void or another hole is necessary.